A swan song from one of Europe’s great intellectuals. After publishing numerous novels, criticism, essays, and so much more, Eco (Numero Zero, 2015, etc.) died in 2016 at the age of 84. Like a few others before him, including Edmund Wilson and Lionel Trilling, among others, Eco proved that one could write for many audiences. Following up on two similar collections, this book contains more than 100 short opinion pieces originally published in L’Espresso magazine from 2000 to 2015. He calls them “reflections on aspects of this ‘liquid society’ of ours,” and they encompass the current crises facing countries across the world, a collapse of ideologies, and the rise of unbridled individualism. They are divided into 13 titled sections, including “From Stupidity to Folly.” Eco was no curmudgeon, but he didn’t suffer fools gladly—e.g., the “excess of stupidity is clogging the [internet] lines.” The author regularly discusses his dislike of cellphones; people “no longer talk face-to-face…no longer reflect on life and death, and instead talk obsessively, invariably with nothing to say.” There’s a distinct Italian lean to these pieces, so some travel better than others, but it’s not so much the information they convey as much as the intellect and thought processes of the conveyor. 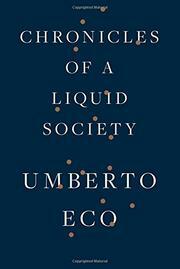 As Eco admits in one of the last pieces, “don’t take the things you have just read as pure gold.” In one piece, he discusses the Italian government selling off their Maserati cars; in another, the letters of Ian Fleming, who “was a master of style,” and James Joyce. We learn that Eco is a big fan of the “amiable universe” of Rex Stout’s Nero Wolfe and that Art Spiegelman is a “genius,” Maus “one of the most important pieces of literature on the Holocaust.” Even when he’s apologizing for not writing prefaces for people’s books, Eco entertains with his intellect, humor, and insatiable curiosity. Although some of these pieces have a tired feel, there’s much here to enjoy and ponder.